We've been in Battle Creek,MI for quite a while now, and the best way to feel comfortable is by creating music and playing it(or playing with it).I had been wanting to have a band called The Transients since I was going to recording school in NYC in 1998. 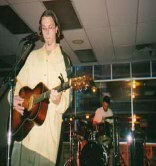 KC and I have made music together for years now with many different people on various occasions. Mainly just writing and recording songs for about two and a half years. Eventually, we had to play live again and wanted to see what we could do as a 2-piece. It's pretty interesting to us so far! Yes, adding members is definitely a likelihood in the future, in fact, we're now a 3- piece if you didn't notice the screen to the right. Mike is a great musician and perfect addition to the band... look forward to a "Meet Mike" page coming soon!! !